Last year, we relocated our Broadspire office in Plantation, Florida to a Leadership in Energy and Environmental Design (LEED) certified facility in Sunrise, FL. This building features green energy solutions such as solar panels that generate power to the computers and copiers, and incorporates rainwater collection processes to source water for the low-flow toilets and non-potable needs. Employees were even provided washable cups to reduce landfill usage from non-biodegradable waste. Crawford keeps a keen eye on environmental sustainability. 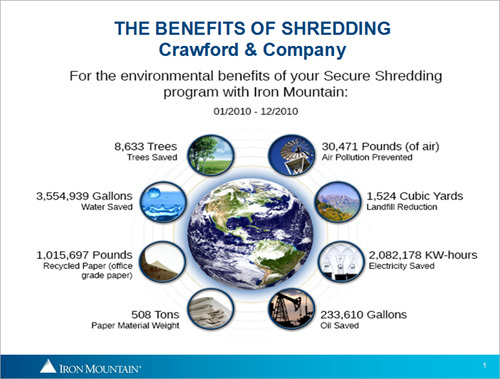 The graphic below illustrates the environmental benefits accomplished by ongoing recycling and paper shredding projects in our U.S. offices throughout 2010.